Quarterback is arguably the most important position in football. As such, this is the first in a series of articles looking at the starting quarterbacks of the Big Ten this year, as well as the ongoing quarterback competitions. To start off, we’ll look at a quarterback playing in one of the conference’s largest markets, but for a team that hasn’t turned the corner. This is, of course, Big Ten Northwestern QB Clayton Thorson. Let’s look at the basics. At 6’4 and 224 pounds, Thorson doesn’t immediately look like an NFL pro style quarterback but isn’t small either. He’s a senior this season, and he played 13 games in all three of his past years. He only made 295 passing attempts in 2015 as a freshman, but was given more chances in the resulting years and threw 478 and 434 attempts in 2016 and 2017 respectively. His sophomore season was undoubtedly his best one. In addition to having the most attempts this year, he threw for 3,182 yards and 22 touchdowns. Thorson was still productive last season, getting 2,844 yards through the air, but he had seven less touchdowns than he did in the 2016 season. However, to realize what’s behind the dropoff, one needs to look at the percentages of each play type for the Wildcats last season. They ran the ball more and threw it less, making the drop in touchdowns and yards less alarming. What is alarming, however, is the ACL injury that struck Thorson at the end of last season. He was injured in the Music City Bowl in what should have been a routine trick play, and missed out on spring football because of the injury. Which Thorson will we see, next season? The one that’s smooth in the pocket, able to evade pressure before placing the ball exactly where he wants it? Or a slower one that’s a shadow of his normal self? It’s impossible to know completely at this point, but from early reports, things are going well. 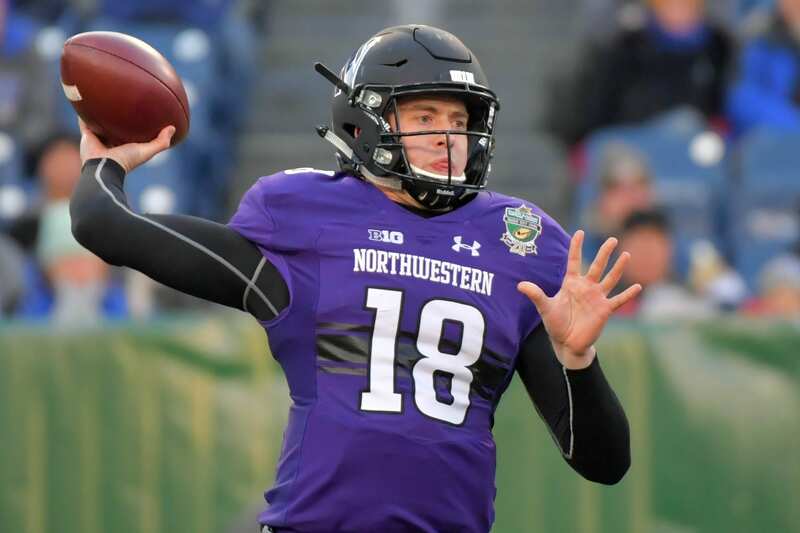 Northwestern head coach Pat Fitzgerald also revealed that the team will make a decision two weeks out on who their August 30th starter is. Thorson, of course, is the option that everyone wants. But if he’s not fully healthy by then, the Wildcats might have to use a starter with little experience, which is not ideal for the Big Ten. TJ Green, for example, is a junior but only has two pass attempts in his career. Northwestern’s other options are freshmen, redshirt freshmen, or sophomores. The Wildcats have the pieces to pull off some upsets this year, but that hinges on the quarterback not losing games for them. And really, they don’t have any depth at that spot at all. Will it hurt them this season? Well, we’ll find that out a couple of weeks out from the Purdue game, when we find out whether or not Clayton Thorson will be Northwestern’s quarterback for the entire season.